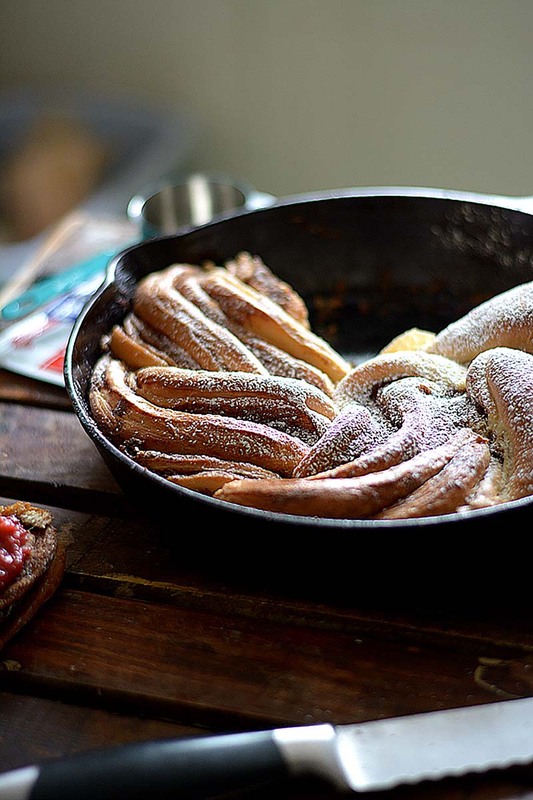 Pillowy buttermilk yeast bread swirled and twisted with cinnamon and sugar, baked in a cast iron skillet. Great when enjoyed warm with jam. Note: Watch Bakeaholic Mama's video below that demonstrates how to shape the skillet cinnamon buttermilk bread. To prepare the bread, add warm water, yeast and 1 tablespoon of sugar in a small bowl. Stir and let sit for about 10 minutes, or until the yeast mixture starts to foam. In the bowl of your stand mixer, fitted with hook attachment, add yeast mixture, warm milk, salt, melted butter and half (1½ cups) of the flour. Turn mixer to medium-low, and once everything is combined, mix in remaining flour ¼ cup at a time until the dough is just slightly sticky. Turn mixer to medium, and "knead" the dough for about 3-5 minutes, or until it is elastic and smooth. Turn dough out into a greased mixing bowl, cover with plastic wrap and set aside to rise until it has doubled (or even tripled) in size. This could take a couple of hours. Once the dough has risen, turn it out onto a lightly floured surface. Roll the dough out until it is about ⅛ of an inch thick rectangle. In a small mixing bowl, mix together the cinnamon filling ingredients. Spread the mixture over the bread dough. Roll the dough into a log, starting with the longer side (just like you would cinnamon rolls). Place into a well-seasoned, greased 8-10 inch cast iron skillet. Cover and set aside. Let it rise until it doubles in volume. Once the dough has risen, brush top with a bit of buttermilk. Bake for about 30 minutes or until it golden all over, and sounds hollow when you flick the top. Sprinkle with powdered sugar before serving, optional. To prepare the jam: Add the jam ingredients into a heavy bottomed sauce pot, simmer on low heat for about 30 minutes. Once the berries have broken down, remove from heat and serve warm over bread. To store leftover jam, place in an airtight container and refrigerate for up to 2 weeks.